With our location abutting both the Chesapeake Bay and the Atlantic Ocean, Virginia Beach fishing offers abundant returns year-round. 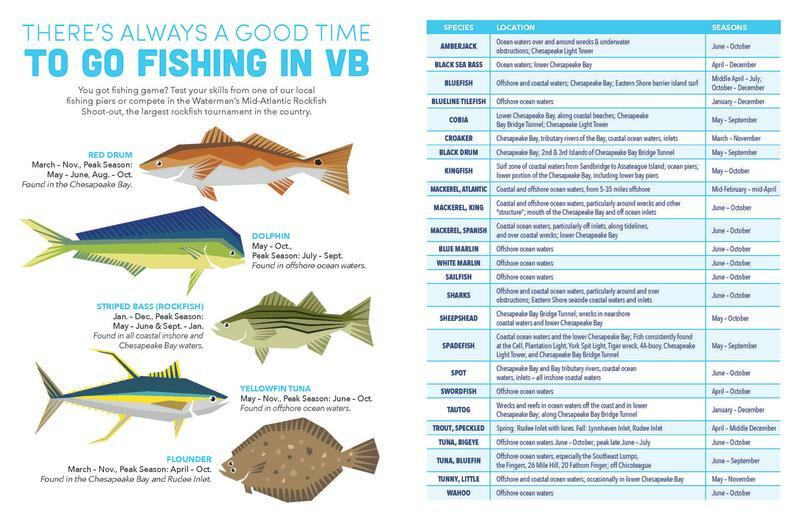 Whether you opt for the diverse waters of the Chesapeake Bay, the endless opportunity of the Atlantic Ocean, or one of many local freshwater fishing spots, there is a seemingly endless supply of fish to be found and ways to catch them. Offshore, the 115 fathoms of the Norfolk Canyon, just off the coast of Virginia Beach, is where the big fish like billfish and tuna reside. And when we say big, we mean BIG. The largest blue marlin caught in Virginia Beach waters weighed in at a whopping 1,093 pounds. Hop aboard a charter leaving out of the Rudee Inlet and let the boat’s crew take you into the heart of the action. 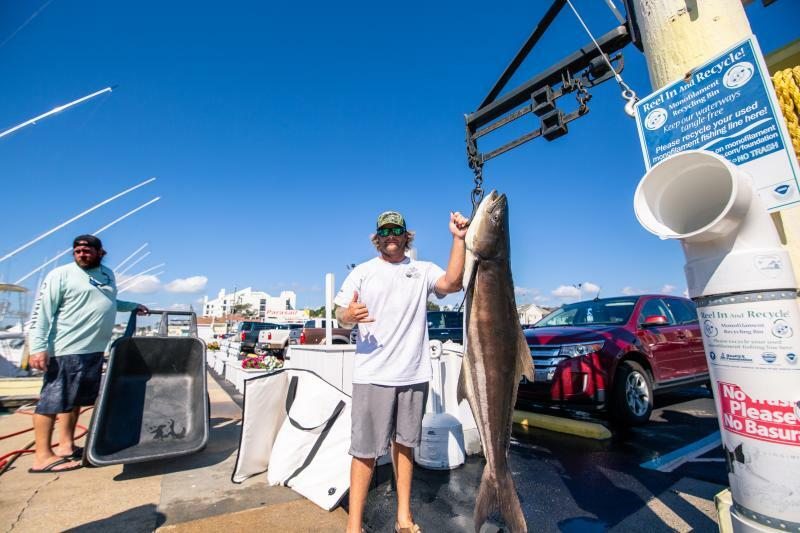 While billfish are released back into the water, you can also match wits with the likes of yellowfin tuna, cobia, bluefish, wahoo and more off the coast of Va Beach, and take some home with you for a local seafood feast fit for a champion. The Chesapeake Bay is another hotspot for fishing fanatics. As the largest natural estuary in the United States, the Bay is home to 348 species of finfish, including flounder, red drum, cobia and the local-favorite, rockfish, all of which can be caught in the summer months. As fun to catch as they are to eat, 70 to 90 percent of the world’s rockfish, also known as striped bass, reside in the waters of the bay, making Va Beach the rockfish capital of the world and home to the Annual Mid-Atlantic Rockfish Shootout every winter. With the Bay producing nearly 500 million pounds of seafood each year, it’s no wonder we can’t get enough. While there are many great charter options for both the Bay and the Ocean that will have you out catching fish in no time, resident anglers fish every chance they get, whether they have a boat or not. If you prefer to keep both of your feet on dry land, you can drop in a line from pier, with the Virginia Beach Fishing Pier at the Oceanfront, the Little Island Pier in Sandbridge, and Seagull Pier on the Chesapeake Bay Bridge Tunnel. One of our favorite ways to get in on the sport is to hop in a canoe or kayak and get closer to the action. 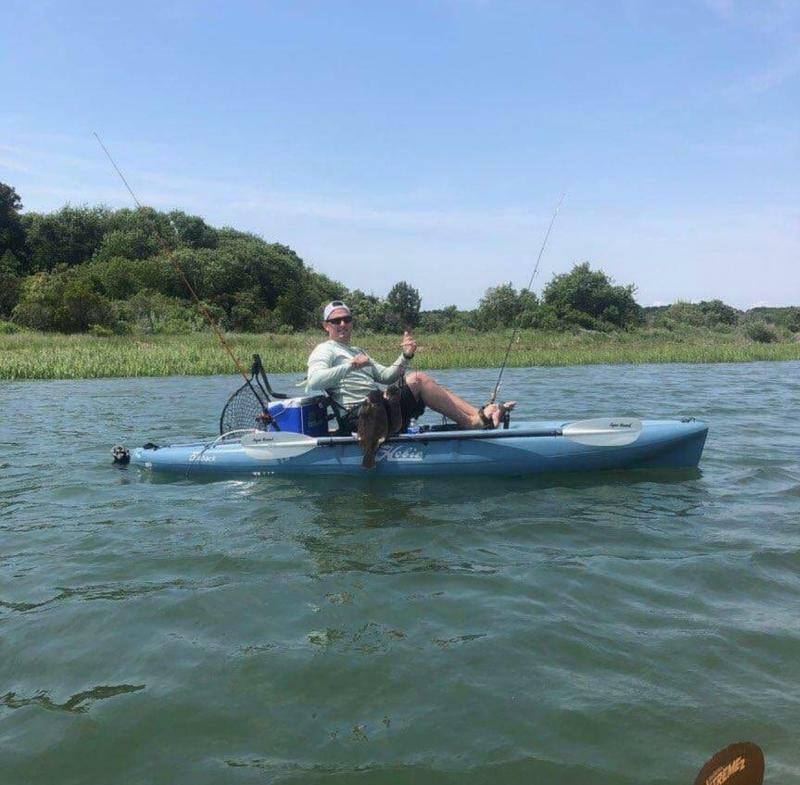 With several recommended launching points at Dozier Bridge, Hutton Circle, Birdneck Launch, and Owl Creek Boat Ramp, and many local outfitters such as Wild River Outfitters, and Ocean Rentals LTD, you can be out on the water in no time. With so many waterways and outfitters in our coastal city, the fishing options in Virginia Beach are seemingly endless. 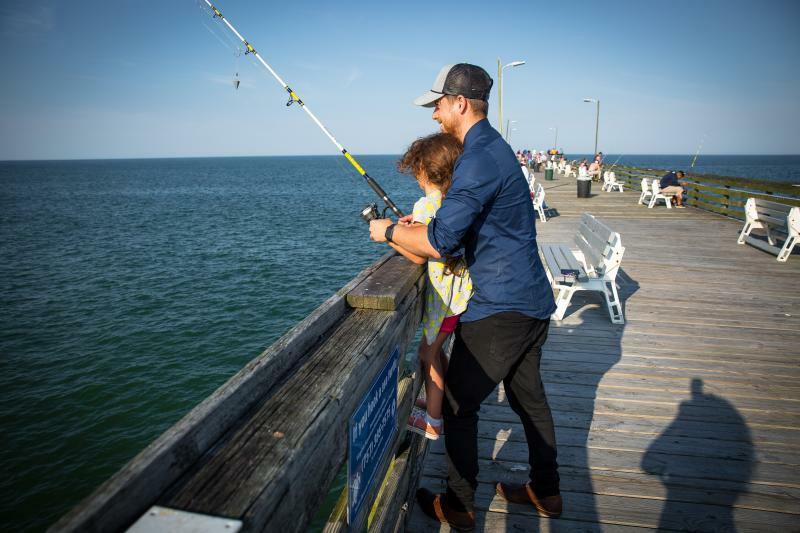 Make sure you check out all of the fishing permitting and regulations before your trip, and take your Va Beach fishing adventure to the next level. Depending on the season you visit, there&apos;s no offseason for fishing in Virginia Beach. From the Atlantic Ocean to the Chesapeake, there&apos;s always something biting in our waters.